Some small boutiques will bring in some obscure Spanish or Scandinavian shoe brands and sometimes I hesitate to warm up to the products unless they are truly outstanding. 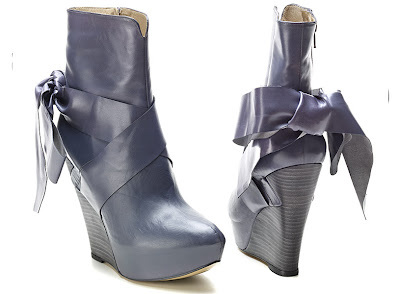 Saying that, I did come across Pura Lopez shoes from Spain and I'm really liking the edginess of her footwear. Some of the boots meets my (new) minimum 5" heel criteria, the quality looks sound, and the price point is good. If you are looking for something that falls in that mid-range pricing ($200-$600 akin to Stuart Weitzman, L'Autre Chose, Modern Vintage, House of Harlow, etc) then I suggest checking this brand out. Apparently, PL has been featured in Spanish Vogue and the designer has made custom shoes for Penelope Cruz in her movies. It's nice to keep an ear to the ground while looking good standing on it... just saying!